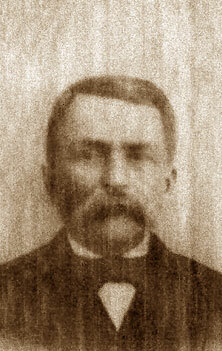 Dr. John Henry Walling was born on 30 March 1840 in Whitesburg, Madison Co., AL. He was the great-grandson of William Walling, a Revolutionary War veteran of the South Carolina Militia. He married Elender Anditon on 13 August 1858 in Marion County, AL. Their marriage would produce seven children, although only two would survive to adulthood, Edmonia and Eugene. Following the war, John worked as the postmaster of Morgan Co., AL and as a doctor, surgeon, and druggist in Morgan and Cullman, AL for more than 50 years. He was a delegate to the Alabama Medical Association and also performed physicals on World War I soldiers departing from Morgan and Cullman County. He would continue to practice medicine into his nineties. He was a Mason and also donated land for the Vinemont Church of Christ. He was posthumously selected as one of the top 100 citizens of Cullman County during the 20th Century for his care to children and the needy. He died 30 April 1935 at the age of 95 and is buried in Mt. Zion Cemetery in Vinemont, Cullman Co., AL. Picture submitted by Rodger D Walling.